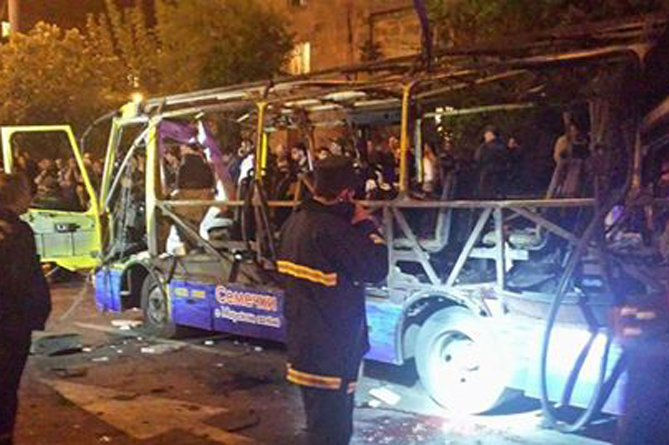 On Monday evening, a terrorist attack took place in the center of the Armenian capital of Yerevan. An explosion on a bus killed two people and injured four. The explosion rocked Yerevan in the context of the latest exacerbation of the Armenian-Azerbaijani conflict, only a day after Armenians across the world commemorated the victims of the Armenian Genocide. No matter who organized the explosion, it will undoubtedly be followed by a rise of anti-Azerbaijani and anti-Turkish sentiments in Armenian society, which could in turn trigger a further escalation of the conflict. The terrorist attack in Yerevan is only profitable for the US. We can expect an intensification of protests and militancy in Armenian society which is directly counter to the beneficial adoption of a peace plan now being worked on in Moscow. It can be expected that the pro-American network in Azerbaijan will attempt to incite further anti-Armenian sentiments, thus influencing the Azerbaijani elite to escalate hostilities.